This week we’re bringing you a sweet, exotic treat from India. 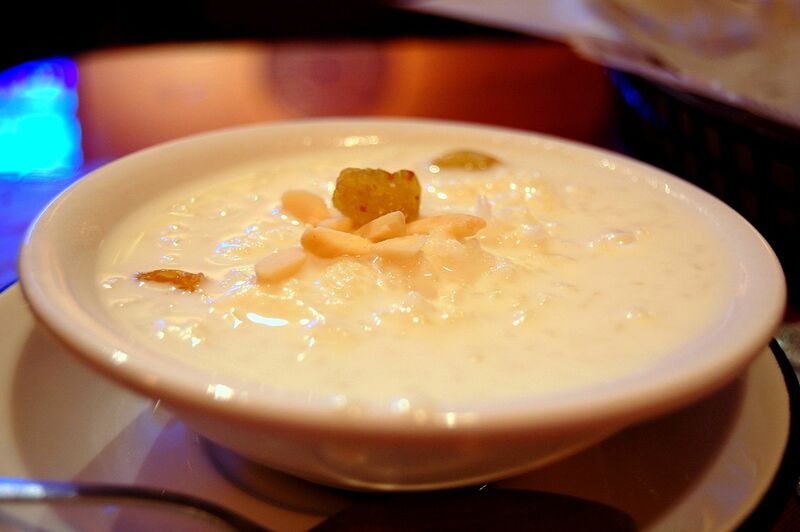 Kheer is a rice pudding made in several variations across South Asia and of course, it has a history! Also called payasam, this ancient dessert comes from the Hindi culture and is most often seen at ceremonies, feasts and celebrations, although it can easily be enjoyed any time of year. Kheer is believed to have originated in the Lord Jagannath Temple, Puri, Orissa around 2,000 years ago where it was served as an offering to the gods. This practice spread throughout South Asia to various Hindi temples where the recipe was altered slightly based on the region. 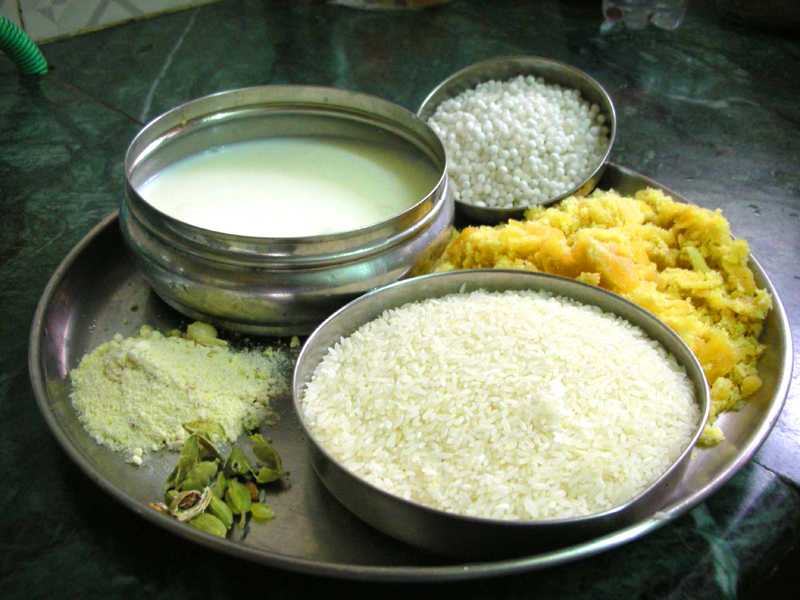 Today, there are distinct differences between the kheer produced in Eastern vs. Southern vs. Northern India. In Southern India, kheer is most often referred to by its Hindi name, payasam, and it is served as part of a tradition based on an ancient legend. The legend comes from the temple of Ambalappuzha and says that Lord Krishna disguised himself in the form of an old sage and challenged the local king to a game of chess. The king was a very good chess player and quickly accepted the sage’s offer. When he asked the sage what he wanted as a reward should he win the game, the sage simply asked for an amount of rice grains for each square of the chess board. He specified that each pile of rice would have double the number of grains of the previous pile. So the first square would have only one grain of rice, the second would have two grains, the third would have four grains, the fourth would have eight rice grains and so on, each pile growing at a geometrical progression from the past pile of rice grains. The king was astounded that the sage wanted such an insignificant reward when his kingdom was full of riches. The king lost the game and began placing piles of rice on squares. He quickly realized his miscalculation and by the 40th square all of the rice in the kingdom was gone. As he finished his calculations he found that he owed the sage 18,447,744 trillion tons of rice, which he obviously did not possess. The sage revealed his true form as Lord Krishna and explained to the king that he did not have to pay back the rice immediately. Instead, he was to serve payasam freely to any who came into the temple of Ambalappuzha seeking food, shelter or simply peace. The tradition continues to this day and any pilgrim entering the temple can request a free bowl of this sweet and ancient dessert. The recipe we’re bringing you today is based on the kheer that is served in Banke Bihari temple in Vrindavan, India, but there are many other variations you can try. Visit some of the links below to broaden your appreciation of kheer, all courtesy of Veg Recipes of India. *Recipe courtesy of Divine Taste. Wash the rice and soak it with enough water to cover the rice for about 5 minutes and then drain the water and allow to dry. Soak the saffron in the 1 tbsp hot milk. Heat the 2 litres milk in a wide heavy bottomed pan or kadhai on a medium flame, and bring to a rolling boil. This should take about 15 minutes. Lower the flame a little, add the rice, slivered almonds and pistachios and cook for 15 minutes more. Crush the soaked saffron in a mortar and pestle or with your fingers to extract a deep orange colour and flavour from it. Put the saffron extract into the boiling milk mixture and continue cooking for 10 more minutes. Now lower the flame and add sugar and raisins. Continue to cook it for 15 minutes more on the lowest flame. Stir in the cardamom powder. Bring to room temperature and chill for a minimum of 3 hours before serving. *Note- The kheer continues to thicken a bit while chilling in the refrigerator, therefore don’t make the kheer very thick while cooking it. You can add a few spoons of lightly sweetened milk if the kheer in the refrigerator is too thick for your liking. This entry was posted in Blog, Bon Appetit Wednesday, Culinary, Culture, Public Life, Religion and tagged ancient history, ancient recipes, AntiquityNOW, Bon Appetit Wednesday, Hindu, kheer, Lord Krishna, payasam, rice pudding. Bookmark the permalink.